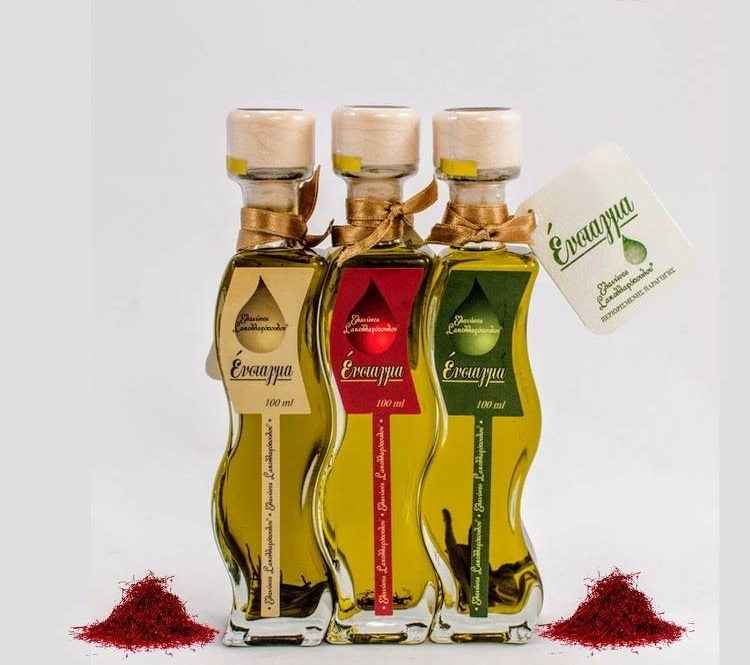 Enstagma Superior Gourmet limited edition is a three-type flavoured olive oil, of high quality, specialized production and expertise which belongs in the category of flavoured gourmet premium olive oils (flavored olive oil). Enstagma Superior gourmet is a unique flavored olive oil made from Koroneiki olives and comes in 3 different types, with natural infusion of saffron, rosemary and sage. It is a flavored olive oil that can complement any culinary cuisine, depending on which type of Enstagma superior gourmet olive oil is chosen, giving character and unique taste with each type of flavored olive oil. Enstagma Superior Gourmet with naturally infused ingredients in the olive oil, surpasses the classic definition of olive oil, making it a gastronomic taste experience. Enstagma limited edition flavored olive oil, undoubtedly belongs to the innovative flavored olive oils, with specialized expertise and infusion of ingredients.